If you recruit for or work in the technology industry, then you probably already know that most product teams can feel about as diverse as a box of Altoids. But do you know just how bad the numbers are? If not, there’s a good chance you’re actually underestimating the lack of diversity in tech. Not to mention that those stats are crucial context for effectively finding and vetting diverse talent. 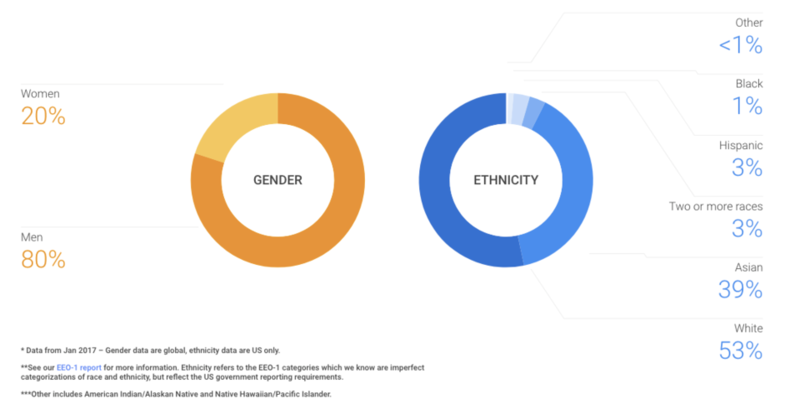 In this post we’ll look at how pervasive the diversity problem really is at big tech companies, breaking the numbers down by gender, race, and age. It’s time to address the elephant in the room, and we’re going to start by measuring how big it is. 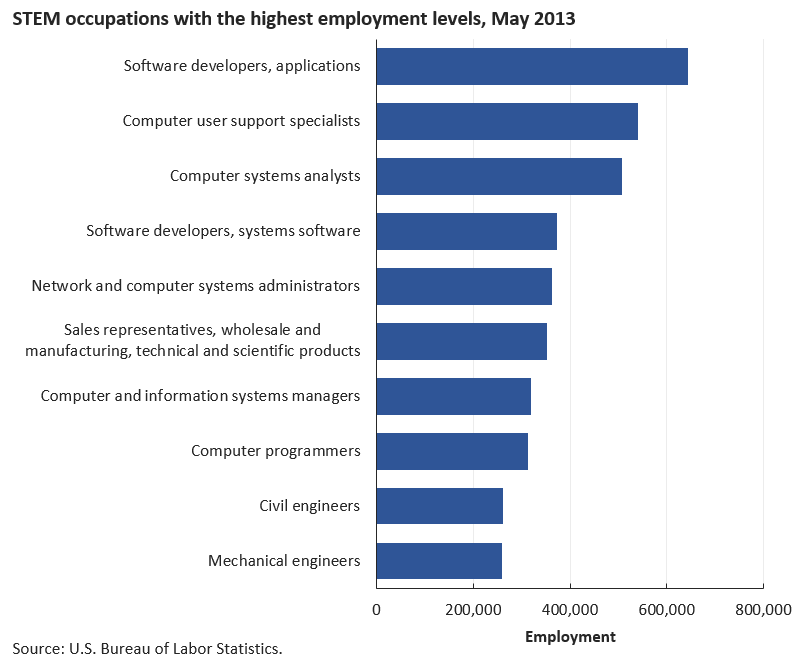 Every month, the tech industry adds about 9,600 jobs to the U.S. economy. Between May 2009 and May 2015, over 800,000 net STEM (Science, technology, engineering, and math) jobs were added to the U.S. economy. Between 2015 and 2024, it’s estimated that STEM jobs will continue to grow by another 8.9%. And sure, you’re probably thinking, “Okay, but that’s STEM.” When it comes to STEM, the tech sector boasts a resounding majority of those jobs. 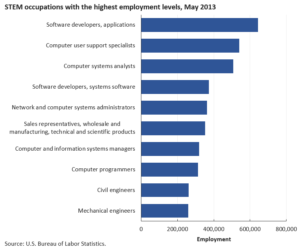 If STEM jobs are going to grow, you can expect tech jobs to do a lot of that heavy lifting. So, um…. Google’s not good at everything. In 2014, Google released its employment diversity numbers, and they were nothing short of terrible. 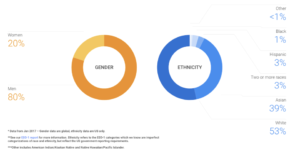 83% of Google tech employees were men, with 60% of the entire tech workforce being white and another 34% being Asian. There was, however, one positive outcome from the release: After Google released its report, the rest of the tech community began making an effort to be more transparent as well. Needless to say, that wasn’t enough to keep Google from taking some heat for their results. Diversity in tech by the numbers. Looking at numbers across the board, it’s clear that gender is an industry-wide problem — one that’s finally being talked about openly. 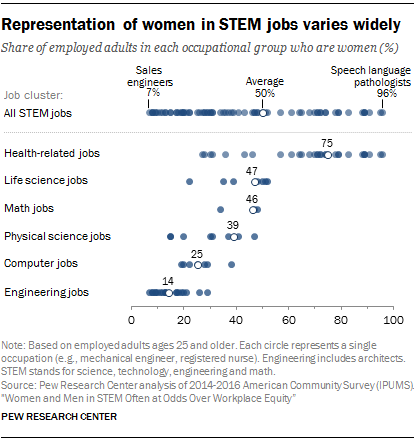 Women might make up 53% of the workforce, with the number coming in at about 50% for STEM fields. But of those STEM fields, tech and engineering lag far behind the rest of the crowd. All of these numbers are capped off by terrible retention in the industry. Women are leaving tech at an alarming rate — but not because of the roles or responsibilities. It’s the culture. Gender diversity might have you shaking your head, but it’s really just the tip of the iceberg. 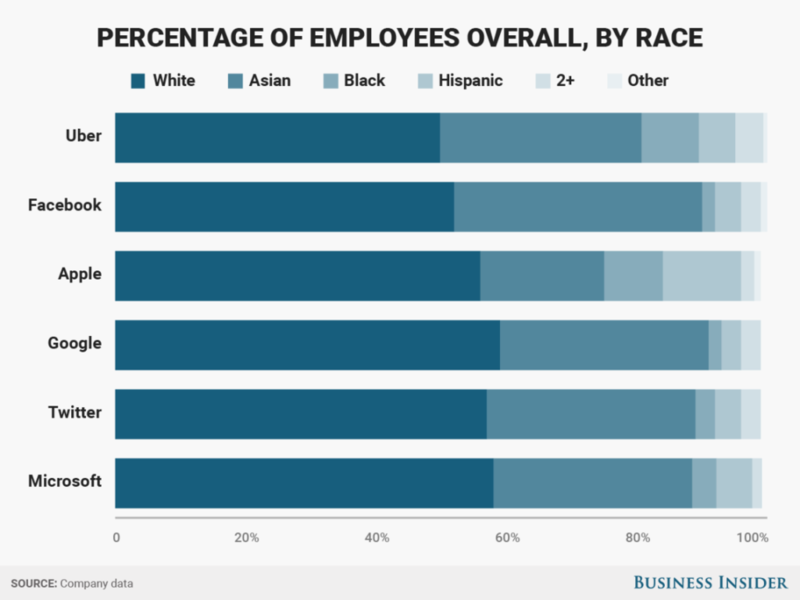 The percentage of black and Hispanic employees at major tech companies is especially low, making up just one to three percent of the tech workforce. In total, the ratio of African Americans and Hispanics to coworkers is about half in the tech sector of what it is in the rest of the private sector. Oh, and did we mention that 83% of all tech execs are white? Stackoverflow can tell us plenty about the state of tech hiring. They went on to state that the results of the survey weren’t accurately reflective of the larger portion of female developers in South Korea, India and China. One country they didn’t mention? The United States. The same survey had a plenty to say about the average age in the tech world as well: The average age of developers is 29 years old, with the median coming in at 27. Tech hiring still relies heavily on poaching and incentives. Who can offer the better perks? Dry cleaning? Hot breakfasts? Work from home? Travel stipend? Between all of this, the hiring process is ripe for disruption. As a recruiter it’s where you can have the most impact. In fact, it’s up to recruiters to begin that disruption at the job description, interview, and hiring phases, meeting an unsustainable ecosystem head on with new ideas, methodologies and practices. Step two: Get leadership to buy in. Step three: Watch the company culture follow. 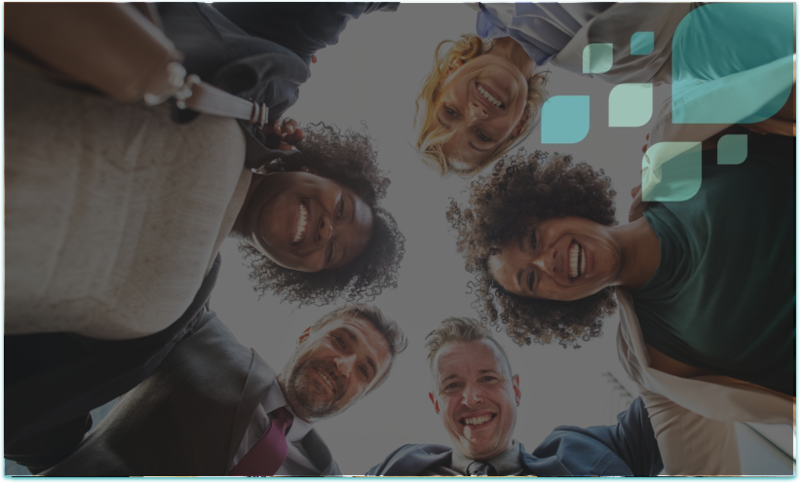 If you’d like to learn more about increasing and supporting diversity & inclusion in your organization, Recruiting Innovation offers a course on Diversity & Inclusion.